If it wasn't enough for me to get to know such a lovely group of people, I also get to review books for these talented authors, which is why you will soon see more and more reviews from me on my blog. I have just finished reading 'Shadow & Voices' by the very talented Jason Ellis. 'Shadow' is a trending book title but I stress now that you Must remember Shadows & Voices, because this book is definitely worth a good read. I could review this book from various perspectives as there are a few vital characters, all with their own individual stories but I think I will start with Holly. Holly Silverstone has been accepted at The Highlands Academy of Truth and Excellence, which is only 15 minutes away from her home. Yet, Holly nor her family, have ever known of its existence before Holly received her interview letter, if you can call it that. The letter was written in ink that just appeared. And only Holly could read it. What's even more strange is that when Holly visits this Academy, it has the same blue door that she dreamt about. And they know about the butterflies. How can they know about the butterflies? 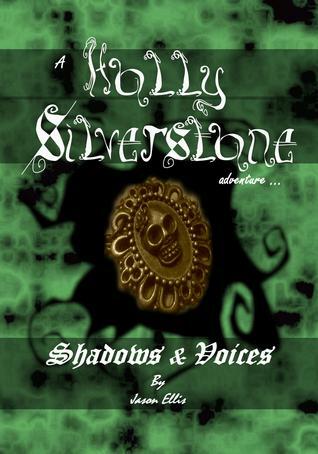 Packed with adventure, mystery and thought provoking ideas, this book involves you into Obscura (the 'hidden world'), mysteries surrounding the shadows and the most entertaining masked Geography teacher, Miss Ovissa Slater. Shadow & Voices had me engaged right from the first chapter and I am disappointed in myself for finishing the story already. I want to know more about the shadows, the doors, the different worlds and most of all, I want to read more scenes with Ovissa and her unfortunate luck in attracting trouble! Everyone, listen carefully. Jason Ellis is of the few that can create a bright spark in a mundane world. Watch out for him and give Shadow & Voices a read .You will see the world with a different eye. Great review! I haven't heard of this before. Thanks for introducing me to it. Thanks Ellen, it really is a great book so do give it a try if you can. Please follow my blog for more reviews very soon! That's some high praise! Thanks for sharing this book...will check it out. Zed, I wonder about that group if lovely semi-crazy people, lol. If we are talking about the same group then you are an awesome addition! Angela, haha...yes it is the same group- I'm glad you approve of this addiction! Audio books: Yes or No.